In "We should learn from US’s F-35 experience" (Australian Financial Review, 5 April 2014) Brian Toohey argues that Australia did not make the right choice with the F-35A stealth aircraft. The advantage of the F-35A over the F/A-18F Super Hornet, is not so clear for Australia, as Toohey suggests. However, one area in which the F-35 has an advantage is the F-35b model, for which Australia's two Canberra Class amphibious assault ships were designed. 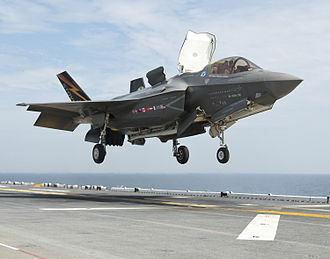 These ships have a prominent ski-jump ramp, to launch short takeoff/vertical landing (STOVL) aircraft, the only one of which is in development is the F-35b. The support equipment for maintaining the aircraft can be trucked onto the ships in standard ISO container modules. I suggest eighteen F-35b aircraft would be sufficient to equip the two ships and provide a reserve. Toohey also criticises government plans to build twelve large conventionally powered submarines, arguing that the F/A-18F and G aircraft would be sufficient to deal with maritime threats. However, even with air-to-air refuelling, the F/A-18 has a limited range. More effective for long range patrol will be the Boeing P-8 Poseidon, a modified 737 airliner, with the F-35's radar and 11 weapons stations capable of carrying a similar payload to the F-35, but over a much longer range. Australia should replace its current six Collins Class submarines, but I suggest this should be with a smaller, lower cost proven design, made in Europe or Asia. The effective range of the submarines can be increased by providing support vessels (which can be Australia made, if required for political reasons).